This weekend was a strong reminder to me of how much musicians miss when the industry becomes about being famous, making money and all the fake things that are associated with it. So many people make music for the money whether they admit it or not, but they are missing so much by not interacting with people and giving back. Shake someone's hand. Talk to them. Hug someone. People remember kindness. It takes so little. The best thing about this industry is reaching people. Touching people in a positive way by communicating with them. People remember those things and they have such a positive, lasting effect. Just so, something negative can create a bad, lasting effect. Ingratitude to God, being unappreciative of the things done for you by your family, friends, audience, co-workers or the people that help you. Sometimes when I'm on the internet, I see web sites where people put a web page that almost serves as promotion for artists, but they do it because they enjoy the person's music. I think to myself, these people don't have to do these things. No one is paying them to do that. Yet, some of them are insulted and unappreciated. Now that's ingratitude. I've seen the industry from both sides. As a consumer and now as a musician and indie label owner. God has taught me so much in the process. I pray I will be able to use what I have learned wisely and to be a blessing to people because I've seen the negative side of things and I don't want to be apart of that at all. No, it's not that trite speech entertainers give people, I mean sincerely make a difference in people's lives and not for the sake of good press. The people I mentioned in the August 30, 2002 article took something else from me. Last week they took the color scheme of this page because they received complaints about the one they came up with for their own artist. This site is gray, dark gray, white and black. That's not a common color scheme especially for singers and their artist's page was black and brown. When I complained about it, I was told by their webmaster that the color scheme is only temporary. They actually admitted it in that statement. The artist even used a vocoder on stage for his new song that I spoke about in August 30th as well. He's never done that before. He doesn't play instruments, but with a vocoder you really don't need to know how to play instruments anyway. My main focus is God and my work. You would think that realizing I'm a Christian they would have a conscience, but some people are too selfish to see that and can only see what they feel is best for them. You wouldn't steal from a church would you. If someone is so clearly trying to put out products that honor God, stealing from them is not that much less of a theft. If something is done for God, why steal from that, in a sense you are taking from God when you do that because it was something done for Him. I give God the credit for all the abilities he has blessed me with and I like to use those talents to make work that honors Him. That is a great joy and source of happiness to me. I do not like people tainting and perverting that using it on their salacious projects. One of my friends believes that's the very reason they stole from me. They figured I'm a Christian, I have a new company, just starting out and won't sue them. That was a gross miscalculation on their part. They would be so annoyed if I did to them what they did to me and I easily could have. I could go to their web sites, read their ideas of what they are gonna do and are doing, then rush out my own version of it before they do. God never taught anyone to take revenge. That is a sin. I wouldn't do that. You do things with good intentions and it turns into predators feeling they have a right to steal from you. In a sad way, it's almost like them thinking I work for them when I don't and never wanted to. I've seen other singers speak about similar situations in interviews or song/music video as a way to clear it all up without resorting to filing lawsuits. Last year, there was a very successful band that did that at a show to illustrate the similarities between their work to another artists by playing the infringing portions of the song back to back... and it worked. I mean, this is a very successful band, yet they still felt the need to point out what was done to them. I kept thinking to myself, why do these people not see how this is all going to look, but if they had the audacity to take from such a well known band, what's to stop them from taking from a new act like myself. I read an article in New York Metro that said "...that sees record labels as generally engaged in the usual practice of ripping off anyone who can be ripped off while remaining oblivious to the fact that Rome is burning." The thing with this industry is, people are so desperate to maintain their success that many of them will do whatever it takes, no matter how unethical it is. It's an attempt to preserve that image of being creative. It happens in the film industry too. That means a lot more to some people than money. The praise from critics and audiences for being innovative or coming up with great projects. The thing with this type of theft is that once someone steals an idea and uses it, they also rob you of credit for your work by taking credit themselves for something they did not come up with. They also reap the financial benefits off of someone else's idea and labor as well, unless they over extend themselves in putting out the product and or the project flops and ends up un-recouped which has happened. It can also render your idea useless, outdated or make it wrongfully look like they came up with it first and you are following their lead. This is why artist do interviews and or songs/video to address what happened. As an artist, you don't want your style to be derivative. Some singers try to live vicariously through their favorite singers as though they can some how attain or touch some of the success or what some would call mystique that they have by doing so or just see a good idea that someone else has and decide they want it for themselves even though it does not belong to them . Listening to other people's music, watching their videos, visiting their sites and then taking elements of what you want from it to make your own record is not being a musician. In all of that, where is your music. It's one thing to do remakes, but your album should not be a compilation of other people's greatest hits. I saw an interview on TBN with Mason Betha formerly known as the rapper Mase. I also saw an interview on TBN with Perri Nixon formerly known as the singer Pebbles. They are both ministers now preaching the Gospel and I think that's great. They've both started successful ministries in Atlanta, Georgia here in America. They both talked about the things they've been through and what they hope to accomplish with their ministries. They spoke of how God turned their lives around and brought them happiness. They are wonderful examples of how God can changes lives for the better. They know more than I do what God is putting in their hearts to do, but I think he has given them a talent for music and it would be great if they recorded music. Ministers like John Hagee, TD Jakes, Juanita Bynum, Shirley Caesar and Donnie McClurkin have recorded Gospel albums. It would be great if they did too, but as I said, they know what God has impressed upon them to do. I wish them the best in their ministries. The United Nations is trying to have a 142 year old law repealed in Britain which would prohibit parents from spanking their children. The law gave allowances for discipline using 'reasonable chastisement''. America is one of two countries that has not ratified this treaty. It was signed by former President Clinton, but not submitted to the Senate because of people opposing the bill. You have the right to discipline your child, so that they don't discipline you. I've seen excerpts of shows where parents were complaining that their children hit them and that they are scared. These children need guidance and discipline. Why are they not afraid to hit their parents. Sadly, violent crimes committed by teenagers are on the rise. In the last month, I've watched reports about two cases where the youngest of the people on trial for murder were age 12. I saw a portion of the first young man's trial. He is a child and is on trial for committing an adult crime. I'm not complaining about the legal system, how people are charged or how cases are tried. It's just the irony of it. This little boy should be in school, not being deposed by lawyers. He should not know the legal system at that age from experience, but he is in that situation. In the second case, the judge was irate that the crime happened. I've never seen a judge react to case like that before. He did not insult the child, however he expressed his frustration and shock that the crime possibly happened at the hands of a young man who is 12 years old. He is not even a teenager yet. I'm not being judgmental, because God can forgive them both if they did in fact commit these crimes. It's just so sad to know that children are on trail for possibly committing these crimes. Children need disciple. If left to themselves, they will do anything. They need rules and guidance. Children fear a spanking more than losing privileges as a form of punishment. If they are raised with the mentality that they can do anything without fear of discipline, it will establish a destructive pattern in their lives that will follow them into adulthood. They need to know that there are rules and that they will be disciplined when they do not adhere to them. Spanking is not child abuse. I do not agree with child abuse at all, but I think repealing this law and prohibiting parents from spanking their children is intrusive and as the frequently used term goes, not in the best interest of the child. The Bible says "spare the rod, spoil the child." I've studied earthquakes for years now (not literally, I'm not a geologist people!). I've read numerous articles and scientific data about them for years now. They've fascinated me since I was about 12. I even included a lyric about earthquakes in "Contemporary Girl" ("he shakes in the dust like you're San Andreas/ you bring out his faults like diamonds from a vault"). San Andreas is a fault that earthquakes occur on. This lets you know I've read a bit too much about earthquakes, to the point that I'm singing about them. There is nothing wrong with promoting one's music, even if it is off topic, on one's page and a bit redundant. Predicting earthquakes - well, they can't. Everything I've read is all guessing. When a scientist uses the word probability it means they don't know for sure. There is no equipment available at the present time to accurate predict quakes or pinpoint future locations. They do not follow a set pattern like a certain number of years apart, at certain points along a fault or a certain amount of kilometers apart each time. They don't seem to be like contractions when a woman is about to give birth, where you can time how far apart they are to predict when a woman is going into labor. Miami Hurricanes - Not the football team, the weather occurrence! I've heard Los Angelinos say, well at least earthquakes happen very quickly unlike hurricanes. While that is true, earthquakes give no warning, whereas with hurricanes you get warnings a week in advance which allow you to prepare or temporarily go out of the path of the storm. Northridge Earthquake - January 1994, a 6.8 earthquake hits Los Angeles' San Fernando Valley. 61 people died and it cost 35 billion dollars in property damage. The Northridge Earthquake is now the most costly natural disaster in the history of this country. The pictures were astonishing. Overturned trains, collapsed highways and buildings that lost stories because they fell into the ground. The Big One - I remember when I was about 12 years old, hearing about the quake that is predicted to hit Los Angeles in the next 30 years. I then started reading about earthquakes to find out more information on this quake people spoke about. This quake is still expected within the next 15 years. Scientists estimate that it will be over 7 on the Richter scale and that thousands will die. There is a precedent for such an quake of that magnitude in the Los Angeles area, thought to have occurred within the last 15,000 years. Geologists believe that Los Angeles has had a quake of up to 7.6 on the Richter scale. New fault lines discovered - New fault lines have been discovered that run right under the Los Angeles basin which is a heavily populated area. This new fault, well you can't really call it new because while it was not visible from earth's surface, it was dormant and went undetected for that reason. According to the Harvard University Gazette, "A violent breach along the entire fault at once could produce a convulsion three times the intensity of the Northridge quake. Such a cataclysm could happen every 500 to 2,000 years and result in an estimated 3,000 to 8,000 deaths and damages of about $200 billion. The problem with trying to give a more accurate forecast is not knowing when the clock started, or when the stress along the fault was last relieved by a major temblor. "But it seems inevitable that, sooner or later, a large earthquake will occur in the Los Angeles area," Shaw says. "And it could well be in our lifetimes." Los Angeles Skyscrapers - For a while now, I've wondered about that. I thought it risky to build skyscrapers in earthquake prone areas. I don't understand why that was done and with the discovery of new fault lines running under the Los Angeles basin, I would think it would be more apparent. Buildings / Structural Integrity - Where the World Trade center collapsed vertically from the senseless terrorist attacks, the shaking from a quake could rock a skyscraper horizontally and possibly cause it to topple sideways unto other buildings as opposed to collapsing straight down. I've seen pictures of collapsed buildings from the Northridge quake and while some of them collapsed vertically losing stories/height others toppled horizontally unto adjacent buildings, so it is possible for a skyscraper to do that as well. 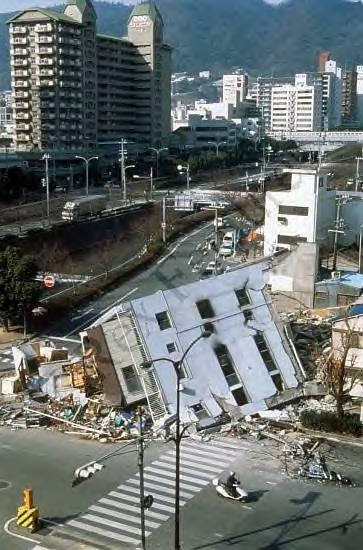 According to the USGS (United States Geological Survey) in Pasedena "The Northridge earthquake inflicted most damage by shaking the ground. It also permanently deformed the ground surface - that is, after the shaking stopped, the ground surface had been uplifted in places"
That shaking up heaves buildings and compromises their structural integrity. While building codes in earthquake prone areas have improved, no building is indestructible. 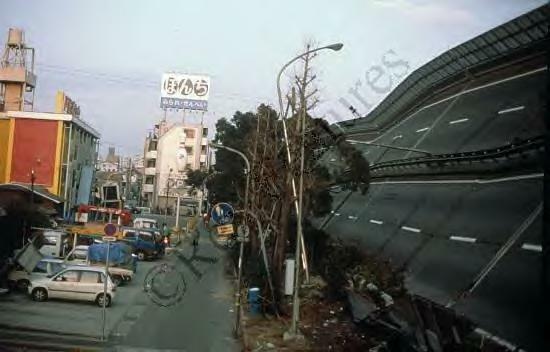 The Kobe Earthquake - Not the basketball player, the earthquake! 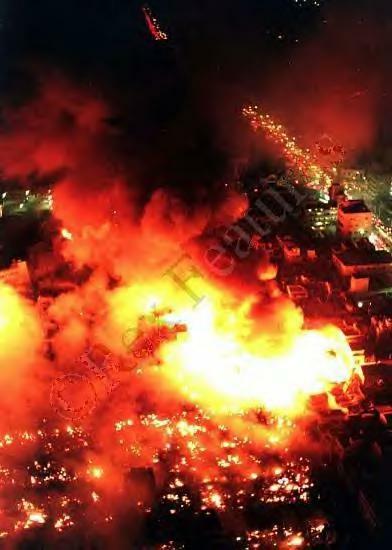 January 1995, a 6.9 earthquake hit Kobe, Japan killing 5,502 people. The pictures from this quake were the most devastating earthquake pictures I've ever seen. New York - Up State New York has been hit by quakes that measure 5 on the Richter scale. Manhattan has not experienced a quake of that magnitude but does have faults running beneath it. Scientist do not believe a serious quake will hit there as was the case with Northridge or Kobe, but estimate that if it did happen, it would result in 100,000 injured and 200 billion in damages. 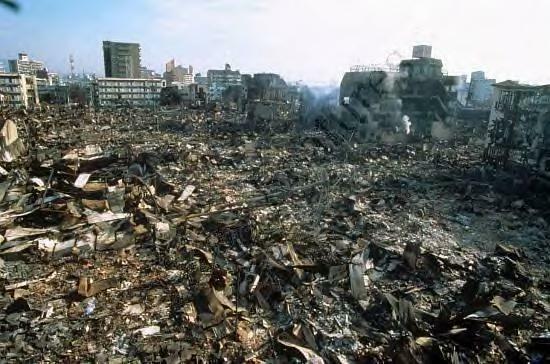 It is a heavily populated area and the skyscrapers would only compound the damage. That is mind boggling. Midlands, England - October 2002, a earthquake with it's epicenter in the West Midlands, measuring 4.8 on the Richter scale, hit England and damaged buildings. You wouldn't think England had quakes, but they do. The devastation earthquakes create is tragic. The sight of broke highways and buildings is astounding. If you live in these areas, what can you do. You can't sit around being afraid. Have faith in God that whatever happens, He is in control. On August 7th, I wrote on this page that artists should not unnecessarily incite controversy with other artists because years ago it ended in two rappers losing their lives. The whole thing seemed to be a big misunderstanding, yet certain parties turned them against each other, motivating what ultimately ended up being their demise. In an article published one month later on September 10, 2002 in a major newspaper, a journalist's claims reignited the conflict that claimed the two rappers lives. I understand journalists feel it's their responsibility to tell the public the truth by reporting the findings of their investigations, but some reports are counterproductive and qualify as sensationalism. The article was inflammatory and the journalists claims are completely unsubstantiated. His sources for the story do not have any proof to substantiate their claims either. I do not know what happened. I was not there. God knows what happened though and maybe we should leave it at that rather than opening old wounds that could claim more lives. Different stories in the news this week about people stealing other people's ideas. Those people are now being sued while others are settling out of court. Bad enough people stealing from an up and coming artist as in the case of what happened to me recently (see August 30th and October 3rd), but the ones I'm reading about this week are about known acts stealing from other known artists. There's an old saying in the music industry "you're only as good as your last hit." In an attempt to stay on top, people become desperate, irrational and steal from other people, even established acts. For many people it's more about the credit and praise for being creative, insightful, innovative, brilliant, geniuses -Aisha playing the violin-. Seriously, that's why I advise people not to send their material to record, film and management companies because not all of their employees have integrity and some will pass off your song, lyrics, beat, script or ideas as their own. I usually advise people who are considering submitting their work to hire a lawyer and have them submit it. Sometimes innocent people get caught up in these disputes because someone they work with stole someone else's material or idea and brought it to them, passing it off as their own. Those people I feel sorry for unless they knowingly go along with the lie to win in court when sued by the real copyright holder, once they've found out what really happened. If you are a new artist with your work on the internet especially material that's your best work or innovative, be careful because certain executives will prey on your site because they erroneously feel the likelihood of you making it is small and feel that their project is of more importance. So they risk it, infringe your copyright, not thinking ahead to what happens if this person sues and or their project becomes a success which would look even worse. As in the case with the nobleman who commissioned "Requiem" by Mozart then tried to pass it off as his own work. This nobleman had a track record of copying other people's music by recopying the original sheet music in his own handwriting, playing it for people and taking credit as the composer. He was a nobleman and Mozart was not as famous as he is today. He was a relatively unknown composer at the time. He probably didn't fathom Mozart would become so successful in the future or he probably wouldn't have stolen his work. I'm also reminded of what happened to a now known producer when he just started. Another producer who was more known at the time took credit for his song and was paid $800,000 in royalties for it. To this day when you look at the credits for this huge hit that was released about 15 years ago, credit is given to the wrong producer who did not write the song. He wasn't even a songwriter. However, shortly after the album was released, the producer that wrote song became very successful, producing many hits for himself and other artists. He did an interview about what happened which the other producer could not refute. He also sued for credit and royalties to the song he wrote. The producer who really wrote the song went on to have a very successful career, while the other producer's career did not flourish and his only real hit is the song he wrongfully took credit for that really belonged to the other producer. On June 10th, I wrote about albums being leaked and how much it cost one artist. On September 28th, I wrote about labels using illegal internet file swapping web sites for promotion by leaking singles to promote forthcoming albums. This Monday, the label I was referring to on September 28th, now has the displeasure of having the entire album by their main artist leaked on a illegal music downloading site, 6 weeks before its scheduled release date. The label said that the album was not leaked deliberately. This label should not have been messing around with these sites in the first place in a misguided attempt to generate publicity for this artist's new album. I wrote two weeks ago that when industry executives use these illegal sites for promotion by uploading professionally edited and looped samples of their artist's work to these illegal downloading web sites, the owner of these sites know it came from the label. It's like giving them incentive to obtain and leak your entire album. Yes, they would leak your album if given the chance, but behavior like this gives them encouragement to go out of their way to get your CD. It's like tempting them and egging them on to get the entire CD, encouraging them to keep breaking the law and infringing other artist's copyrights. As I said before, people will not buy something they can get for free, so an album being leaked weeks in advance will have a negative effect on sales. Anything done to combat that such as a free DVD will create extra costs for a product that could have been issued on its own. Adding extra songs is not much of an incentive either once the public has the bulk of the songs on the album. There was a case last year where an artist who's CD was leaked decided to shelve it and record a new album. That must have been frustrating. It was a costly write off and a drastic, risky move, but at that point in that artist's career, he could afford to do that and the new one did go on to do very well. Several people at his label were also fired by the CEO for leaking the album to these illegal sites. The artist I wrote about on June 10th who saw a decline in his first week sales of almost 300,000 copies, usually averages big numbers in first week sales. His album that was leaked was not a sophomore album, it was his third release for that label which gave him a bit more leverage. In spite of that, they still included a free DVD to help combat the effects of the leak, but there was still a decline of almost 300,000 copies and there should not have been under the circumstances. However, it is not the same case with the artist who's album was leaked this week. It is his overdue sophomore album (sophomore = second) which is considered the most important of an artist's career. His debut album had moderate first week sales and the first single from the leaked album has received mixed reviews from audiences because it's a departure from his previous style. How will all of this figure into albums sales, especially first week sales which the industry puts such a premium on. Pushing up the album's release date as some have done in an attempt to minimize the effects of a leak would be risky in his situation because the label just started promoting the album last week. My point (yes I have a point) these leaks are detrimental, costly, counterproductive, time consuming and a general nuisance. I recently visited one of these illegal sites. I did not sign up and I did not download anything. They had a sign on the front page that read 1.8 million users currently on line. Some sites don't even have 10,000 people visit it per year, yet there were 1.8 million people on that site at that moment, most of them illegally downloading music. Some of these illegal sites have the audacity to charge a minimal monthly subscription fee for unlimited access to download songs they do not even have ownership of, from an on line catalogue of hundreds of thousands of songs they illegally assembled. That is copyright infringement at its highest. "Aisha's Rules of Home Studio Recording...And Commercial Studios too"
1. Remember to plug in and or switch on the microphone. I've found that helps. It's like putting film in the camera to take pictures or removing the lens cap off of a video camera or camcorder, a must! 2. Remember to plug in your instruments before recording. I've found that helps as well. 3. Pee first, sing later. Hey, why stop a good take cause you have to go to the bathroom. 4. Generally, it's not a great idea for a vocalist to sing when they have indigestion. Burping on tape does not spell a good record...or any other bodily functions for that matter. 5. When singing or speaking into the microphone, as the phrase goes "say it, don't spray it." 6. Don't shout, microphones are people too...alright, they aren't people, but you get the point. 7. When singing in the booth, please turn off all pagers and cell/mobile phones. Thank you! 8. For studios with not so great insulation/sound proofing *cough* or none at all: If you can hear that dog barking outside, so can the microphone. Same rules apply for airplanes, your neighbor's lawnmower and car horns. Not really a rule but: I can write, produced, engineer and master records, so why can't I get the wrapper off of a new CD more quickly. It's that extra-strength-triple-action-can-weld- steel-together-super glue adhesive they use on the label at the top of the CD with the artist, label and UPC number on it. It sticks to the top of the CD and seals it shut like a vault. Yesterday, after coming out of a record store, I didn't have my usual CD opener (no, not the ones they sell in the store, a paper clip! Ah I should have just used one of my house keys) and it took me a bit more time than I would have liked to open a CD I purchased. I was told a few days ago that I hurt the singer's feelings that I spoke of on August 30th and October 3rd. While it wasn't my intention to hurt anyone, under the circumstances, I'm the one that should be upset. Though I may not act like it, I'm the victim. I'm the one that is owed the apology and the people they shamelessly disrespected with that other unethical issue I mentioned, that I had to contact them about in the first place which lead to all of this. For as long as I work in this industry I will let that other unethical thing they did be a reminder to me and the people I work with of what not to do. Still, I wouldn't have done that anyway. My contention is mostly with the singer's managers and another field employee who are largely responsible for what has transpired. I wasn't the one that created this situation. I was trying to protect my work/copyrights. This is something I was thrown in to due to their unconscionable actions, so how can they be upset that I'm legally defending my rights. They didn't even deny it when I made these claims, they fed me an excuse. I don't play games with people, I keep to myself and do my best to stay out of trouble. I don't interfere in other people's business and I do not expect other people to interfere with mine. I'm very busy, I didn't need this right now. I remember when I wrote the August 30th article, some of the most blatant of the infringing material was removed from their web site the next business day. They haven't denied it either, their words and actions confirmed what they did. Using the interact page, even going as far as using the same text I worded for my page, on their own site, only substituting my name with their artist's, then stealing this page's color scheme is copyright infringement. I actually copyrighted this web site's layout, design and contents including the words, music and interviews with the Library of Congress before all of this happened. That copyright warning at the bottom of the page is there for a reason. It's not to make the page look cute or official. I've loved vocoders since I was about 12. That's when I read about them for the first time. I was fascinated by the way they could transform a human voice to sound like a robot. I love electronics and instruments. I've wanted a vocoder since then and now that I finally got the opportunity to use one on a record, I was annoyed at what they did. It has sentimental value to me. I didn't invent it and other artists in certain genres use them too, but they got the idea to use a vocoder on their song from article 8 click here. In the 6 years they've been recording they've never used this application. For me, it's more about the principle of it. It bothers me for the simple reason that it means they were reviewing this web site and taking ideas for their own project. The thought of that infuriates me. The vocoder idea, the interact page, the color scheme and a few other things I won't mention right now are not coincidences. It's also about courtesy. If another singer says they've done something, don't do the same thing, put it out first and make it look like they are copying you. Why make an unnecessary enemy out of someone that has done nothing to you and in an industry that is driven by material. That's the rule most smart executives in the industry operate by. I didn't do all this work, come up with all of this stuff by God's grace and pay copyright fees for some other label to sit here with their notepad taking what they want. I don't work for you! It's one thing when you have questionable lyrics or a raunchy stage show, that will evoke criticism, which I don't but outside of that, as a musician I do not feel the need to defend or explain my music and I sometimes wonder why other artists let people make them feel there is a need to do so. This is the music I love and as much as I make it for other people, I make it for myself as well because it is something that I totally enjoy. I just explained it didn't I.. kidding. My point is that most people should be able to understand that. Yes, feedback is good, but with limitations. You cannot cater to everyone and everyone will have an opinion. So, why be overly concerned with what people think. That's something I do not make a habit of doing and do not understand why people allow others to subject them to that. I'm not haughty, uncaring or insensitive. I'll concede that I'm somewhat jaded, but not deliberately. It is because I've heard and seen so much in my 25 years, some of it real and with depth, some of it without merit, so I discount so many things that aren't profound as a result. I'm comfortable in my own skin, know what I believe and know what God made me to do in life based on the abilities He has graciously and mercifully give me. I know what I like and what I don't like. So, if someone were to try to impose something on me that went against that, I would discount it. My point, if you pay attention to opinions too much you will end up confused and insecure. Your self-esteem will be shattered and you will be scared and reluctant to make decisions. You can't allow yourself to be tossed to and fro by other people's opinions. 1. Some people will give you sound advice out of genuine concern. You can get something out of what they are saying and benefit from it. 2. Sadly, a lot of people give bad advice, though sometimes not intentionally. They think they know what they are talking about, but they are off base. 3. Then there are people that have ulterior motives and give their opinions as though they are looking out for your best interest when they are trying to manipulate and control you. 4. Then there are some that will be jealous of you and say things that on the surface appear to be out of concern, but they are really trying to drag you down or get to you. Opinions like that, totally disregard. It's not worth your attention. 5. Then there are the arrogant ones that do not like you and are jealous and envious and will brazenly say anything they can think of to get to you or drag you down. For example, the other day I heard someone criticize Whitney Houston's singing voice. I thought to myself, oh I've heard it all now. How do you think a person looks criticizing someone's talent with that type of vocal ability. Then it really dawned on me, people will say anything to suit their purposes or argument if they don't like you, even if it means lying. With all that in perspective, you can actually laugh at that stuff. Also, When you give advice, which of these five individuals are you. If people want to think something erroneous or bad about you they will. If it is slanderous or libelous, you can sue, but don't let other people's opinions run your life. That was advice as in example #1. The elections in Jamaica are now over and the Prime Minister PJ Patterson has been re-elected. Seven people died in this years elections and that should not have happened. People should not be killed over an election, but sadly it happens. Some people get too passionate and fanatical about politics and lose their sense of reasoning. Former President Jimmy Carter went to Jamaica to act as a mediator and discourage further blood shed. People have misconceptions about Jamaica and the Caribbean in general, believing stereotypes such as we all smoke marijuana. I've never smoked marijuana. I've never even smoked a regular cigarette. I can't even spell the word correctly, I had to use a spell checker in writing it today. Another misconception is that we all live in huts. There are millions of well constructed concrete homes in the Caribbean. Many of them with pools, satellite dishes and cable. People stereotype Haitian people as well, as people who all practice voodoo and eat cats and that's not true. There is prejudice among blacks people as well. Some black Americans see Caribbean blacks as outsiders. Just so, some Caribbean people are prejudice against black Americans. Then there are black people who are prejudice against other black people because of their skin color, facial features and or hair texture. There is also prejudice in the Hispanic community. Some Hispanic people look Caucasian while others look black and some discriminate against each other for that reason. Then there is the Cuban vs. Puerto Rican dispute that I've heard so many Hispanic people make slurs about over the years. I've heard jokes about other races and my own from black Americans that didn't know I was Caribbean, Hispanics that thought I was Hispanic, Caucasians that made jokes about Hispanics, Hispanics making jokes about other Hispanics based on their ethnicity. I could list more examples, but it all seems so ridiculous to me. Cuba - Growing up in Miami, I've heard so much about what happened in Cuba from people who's families had to flee the island when Castro came into office in 1959. It's amazing when you think about it...so many people suffered and continue to suffer. I've heard many stories and seen the sadness in people's eyes when recalling what happened. Then I witnessed what happened with Elian as someone who lives in Miami. I think Cubans and Haitians are brave for taking to the sea, battling such a harsh journey in search of a better life in America. It is courageous to flee political oppression. I think democracy is great. I've thought about the journey people make at sea over the years and what it must have been like for them. It makes me very sad to know that anyone endures that journey through shark infested waters, let alone a little boy. I do think a child should be with its parent though. I think a lot of the confusion and racism in society is based on ignorance. People not knowing about each other and letting their imaginations get the best of them by stereotyping what they think others are like. We need to take the time to learn about each other. God made us in His image. But if the devil can convince you to hate someone because of their skin color or ethnicity or to fight violently because of politics, then he has played you for the fool. What is the product of all of that...hatred and violence. How is that a good thing. Have you seen CD singles that have so many mixes on them that you confuse it with the album for a second. Isn't it strange when a band changes members so many times that you don't recognize the group anymore. Cyber squatting, isn't it just poorly regulated, legalized extortion. I can understand when a singer leaves secular music to become a gospel singer. I think that's commendable, but what I don't get are secular singers who switch secular genres with ever album and then speak disparagingly of the previous style or image when it doesn't suit their purposes anymore. They blame the label saying that the previous image wasn't really who they were when it doesn't tie in with their current image. You didn't blame the label when you took those royalty checks. I hope you find who you are before the label puts out your greatest hits. If someone offered me 20 million dollars to do music I didn't agree with I would not do it and would not take the money. I've loved British Music since I was a kid. I know the British music industry very well. In the UK, a single can debut at #1 based on sales alone. I like that because in America it's more difficult because airplay is what they use to determine your chart position and airplay can be manipulated. You can sell well but still place lower on the charts because of lack of airplay. The thing I don't understand though are critics bashing songs on the UK charts that place in the latter part of the top 10. I've seen songs reach #6 or#7 that were subsequently dubbed failures by several journalists as though that was a bad chart position. I don't understand the reasoning behind that because in America if you get in the Top 40 that's considered good. If you get into the top 20 that's really good and anything in the top 10 is considered a great chart placement. Why do some people name them or brag that they've got them like it's supposed to make them a better person. If you don't have much class and behave in a crude or vulgar manner, a designer name isn't going to compensate for that. However, changing your behavior will. People with class don't say they have class anyway. Not being facetious, but some people make designer clothes look not so designer anymore when they wear them to the point that when they brag about what they are wearing you think, are you sure. I don't get why some women ask their husbands to hold their purses for them in public. I was in a check out line (yeah like the song) and there was a guy holding his girlfriend's purse for her, she started teasing him about it and he said to her, I'm secure so I can do that. I'm like are you sure, you're carrying your girl's handbag...not just a purse, a red purse! Only if the purse were pink would it have been funnier. People miscalculate and misjudge me often and as a result try to pull the wool over my eyes. I don't talk a lot, but when I do they think because of the way I speak and how I look that I'm a push over...well I'm not and I'm not as dumb as I look (did I just call myself dumb...I'm not dumb). Example, someone tried to con me a few days ago and it turned out quite funny. He didn't know I knew the truth about what he was talking about and could have conned him instead, but I didn't. An employee of the place we were at laughed at him and winked at me when I told the other guy the truth about what he was trying to say and how it actually operates. In the end he was a bit shaken by what I said and that I knew about it. A contractor tried to con me as well and my dad witnessing the spectacle and my response to it, started calling me "Iron Maggie" (Iron Maggie was Baroness Margaret Thatcher's nickname given to her by the press). Saddam Hussein was re-elected as the Prime Minister of Iraq by a 100% margin. He let the prisoners in jail go free with the exception on non-Iraqi spies. How uncivilized and barbaric. What a twisted idea. Can you imagine if they did this where you live in America or England or France. That would be mayhem. So how is Iraqi, a war-torn, impoverished nation going to survive such an idea. It's like turning evil loose on a nation by releasing unrehabilitated murders, rapists and thieves to roam free and prey on people all over again. Iraqi residents have expressed their concern. To generalize everyone by giving amnesty under the circumstances is a bad idea. How can you know who is rehabilitated, it is after all general amnesty. To let unreformed prisoners go free into society and in such large numbers will have repercussions. There will be a surge in the crime rate and innocent people will suffer. It is believed that he views these prisoners as potential soldiers for war -cough- ulterior motive for letting them go. Hussein has resisted UN disarmament efforts and he has nuclear facilities. It's blatantly evident that the situation in Iraq is serious, yet there are pundits that have this relaxed attitude about it all. I'm not referring to the government. I'm referring to journalists who's articles I've read and interviewers who's shows I've seen on the subject. Saddam must read their articles and watch their shows and laugh at them for underestimating him, because he unlike they, knows what he is planning. Now that the jails in Iraq are relatively empty, there's room for Saddam and his cronies. Al Furat Manufacturing Facility - Construction of the building depicted on this graphic was suspended in 1991. Construction resumed in 2001, and the building appears to be operational, although the tall section at the rear of the building has not been completed. Nassr Engineering Establishment Manufacturing Facility - The graphics illustrate the 1998 destruction (during Operation Desert Fox) and subsequent reconstruction of machining buildings assessed to be capable of producing precision components for centrifuges and missiles. This machine plant produced centrifuge and EMIS components for Iraq’s nuclear weapons program prior to Desert Storm, according to the IAEA. Fallujah II - located just northwest of Baghdad -- was one of Iraq's principal CW precursor production facilities before the Gulf War. 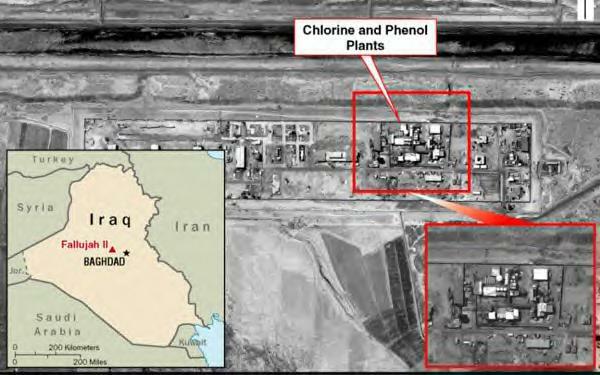 In the past two years, Iraq has upgraded the facility and brought in new chemical reactor vessels and shipping containers with a large amount of production equipment and expanded chlorine output far beyond pre-Gulf war production levels -- capabilities that can be diverted quickly to CW production. One of the main radio stations in England has a new contest where they give unsigned acts the chance to have their song played on the air. This industry has so much politics especially with airplay that it's a refreshing idea. I've seen other stations hold similar contests, but this one offers the winners the opportunity to have their record played several times a week for a certain length of time as opposed to once. I recently read about a dispute between a well known singer and a songwriter who has worked with him on his biggest hits. The newspaper and songwriter blamed the dispute on the artist's management and their attempt to control the artist because they felt the songwriter had too much influence on him. The management allegedly turned the singer and the songwriter against each other in what they thought would give them leverage. In my opinion, they took a serious gamble and lost, they just don't see it yet (gambling isn't good anyway). What they failed to see is that in doing so, they hurt their own artist's career and themselves financially. This songwriter is one of the best in his genre. They grossly underestimate his value. The songs he wrote has earned that company millions. They probably figure they can find another songwriter easily...yes, but some writers are more talented than others. Will the new songwriter compose songs that are as successful...not likely. It's a shame because that songwriter was very instrumental in this artist's success over the last few years and removing him from the equation was not a good idea. Make it worse, he was his friend. Why do some people do these things. I meant that rhetorically because I know it's done to secure certain parties best interests and not necessarily the artist's. However, history has shown that it always has some negative consequence. I wish more people would think ahead when they do these things because people in the industry seldom let these offenses slide and they usually end up in awful public disputes which were avoidable like the one I just mentioned. You know what the sad part is, if that artist's next album flops they would drop him like a hot potato, whereas that songwriter was actually his friend. On October 19th I wrote an article on here about politics and racism. The same label/artist I spoke of on August 30th and October 16th that has been infringing my copyrights did the same thing again. Three days later on October 22, the artist did an interview on a music news site. Do you know what the article was about...politics and how it's wrong for black people to look at other black people differently because of their skin tone (on October 19th I wrote - "Then there are black people who are prejudice against other black people because of their skin color, facial features and or hair texture"). It is also wrong to quote other people's work in your interviews as though they are your own...and this is not the first time it has happened. I wrote about politics and racism and 3 days later you were speaking about politics and racism, especially racism among blacks (the same thing I wrote about) in your music interview. I remember another incident, which is one of several, where I wrote about a current event/music, then one month later, seeing the same thing I wrote repeated in a newspaper article by the singer I mentioned. To prove my point, I even did an article search on the internet and it is amazing that we were the only two people that said these things about music and current events, yet each time I said it before he did. I have copies of when I wrote it and published it to the site, then a copy of where he said the same thing after. It's even gone as far as repeating things in his interviews that are in my bio! I'm not a speech writer and do not want anyone trying to turn me into one against my will. This web site is not a reference guide or dictionary for people to extract quotes from to repeat in interviews as though it is coming from them. It is wrong and lacks integrity. Everyone needs to do their own homework. I spend hours working on this site and not for someone to rip it off it 2 minutes and pass off portions of it as their own. I have been keeping accurate records of all of this for legal reasons. Of all the infringing they've done from well known artists who have spoken out about it publicly as I mentioned on October 16th on this page, my case is the worst one. From illegally using this web site's interact page, color scheme, the vocoder idea to blatantly ripping off articles I've written. They aren't thinking ahead to how they are going to explain all of this later. I do not like Halloween. I'm not afraid, I just don't like it. There are ghoulish costumes, horror films, which I dislike, on televisions and that general attitude of mischief, fear and lasciviousness on this day. There are people who are witches (no, not your co-worker that harasses you). There are people who are Satanists who call themselves witches and claim this day as a religious holiday. Just like we are Christians and Christianity is recognized as a religion, Satanists view Satanism as a religion...but we Christians are nicer and much cuter (just thought I would interject a little humor to lighten the mood of something that is very sad). Seriously, if you are involved in any kind of witchcraft, Satanism, Santeria, voodoo or any other ungodly practices, I implore you to stop because nothing good will come of it and it has its repercussions. It is evil, oppressive and gives you a false sense of security. I encourage you to put your faith in Jesus. He will forgive you. Like most clever marketing ploys, Halloween has been revamped in to something that appears harmless and fun, but the truth of the matter is, it is not. On this day people desecrate graves, do animal sacrifices and very sadly human sacrifices as well. We do not have a day celebrating Hitler who mercilessly sacrificed and slaughtered 6 million Jewish people during the Holocaust. So why do we have a day that celebrates when Satanists sacrifice others. We look at the Holocaust and lament and grieve for those that were murdered. Ironically, Hitler's mother was influenced by a witch. Children are enticed with the concept of playing dress up as their favorite characters and getting free candy. Which kid wouldn't like that. Sadly it is not harmless. It's origins are rooted in Satanism and it is designed to desensitize people to immorality and violence. Christians do not celebrate or participate in Halloween. During the episode I mentioned, John spoke of churches that have come up with alternatives for children on this day such as putting on Bible plays at the church and giving the children candy as opposed to them going out trick or treating. I encourage you not to participate in this holiday. It is sacrilegious, dishonors God and should be recognized as such.